Société is pleased to present Menace II Société, Ned Vena’s third solo show at the gallery. The exhibition expands on the artist’s ongoing series of target paintings, further investigating the relationship between a target’s formal qualities and its connotations. Each painting is hand-stenciled in layers of black aerosol rubber and tinted polyurethane over vinyl adhesive circles, which Vena cut using a commercial plotter. Because the size of each canvas, 64 inches in diameter, is too large for the plotter to handle, the stencil must be split into quadrants to be cut. When the vinyl sticker is removed, a slight material runoff is left at the junctures – four faint lines reminiscent of crosshairs. These minor idiosyncrasies highlight the works’ handmade nature and differentiate them. 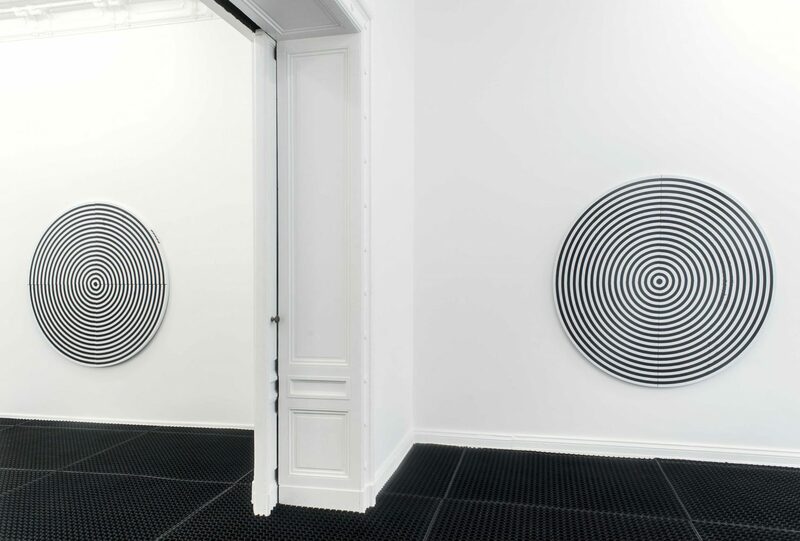 Three of the gallery’s four main rooms are occupied by pairs of paintings, whose disconcerting optical effect is exacerbated when placed in twos. Throughout, the hardwood floors have been covered with a thick, rubberized anti-fatigue matting typically used to relieve the joints of workers who spend hours on their feet. An industrial rubber smell – mitigated by air purifiers – pervades the space. 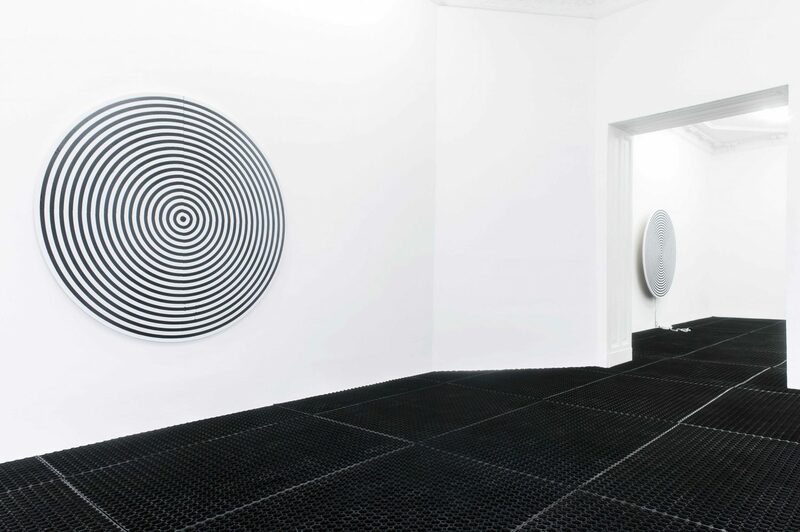 In the fourth room, a painting titled Plug is fixed to one wall with an audible motor that drives it to continually rotate. The spinning canvas – conjuring puns like ‘moving target’ and ‘action painting’ – introduces a wry humor into the repetitive, serial works. 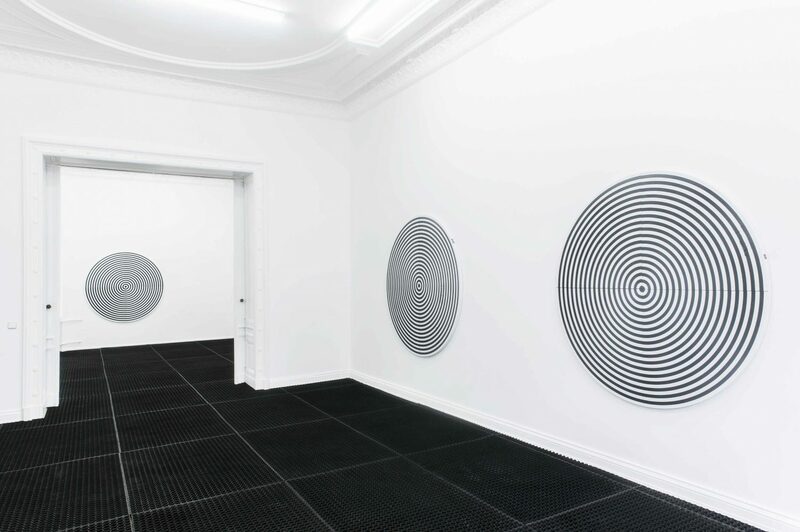 While its installation draws attention to each painting’s individual qualities, its steady rotation along an axis implies the futility of the type of formal innovation typically associated with art historical progress – especially in light of the target’s loaded connotations within the lineage of American art. Vena’s inclusion of two ‘real’ targets like those used in shooting practice further complicates the relationship between copy and original. 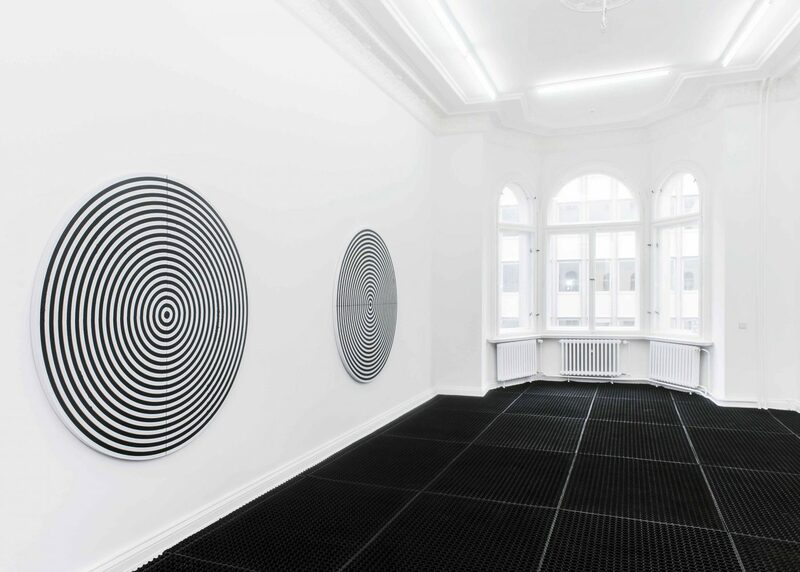 These standing targets, placed in two peripheral entryway spaces to the main rooms, have been painted white and patterned with bits of black vinyl adhesive – in shapes resembling camouflage, a spray of buckshot, or splatter paint. The violence in this show lingers but never breaks through the surface; the black-and-white unity of the pared-down works is totally devoid of a shock of red. Here the violence is all the more ‘menacing’ due to its absence.